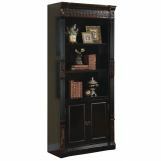 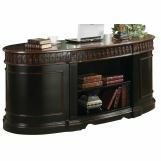 This elegant shaped executive home office group boasts a gorgeous two-tone finish. 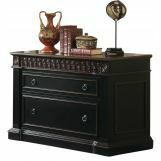 Features 7 drawers in the large oval executive desk, a keyboard drawer and two cabinets all with full extension drawer glides. 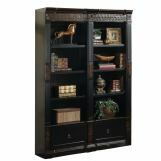 Large bookcase features 2 file cabinet drawers and each bookcase has an option to be out together to build a library wall.